I originally saw this recipe in an All You magazine. I think this combo is great for our rather warm California winter. You get a little bit of warm with something nice and cold. 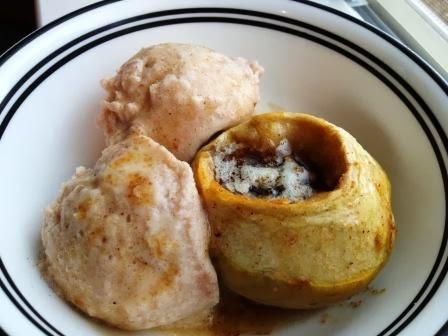 The cinnamon ice cream gives a nice blend with the baked apples. I like to make my own ice cream, and honestly I don't know why other than just because. There really is no reason why. Usually it's because I just don't have enough room in my freezer to justify leaving a container in there. Plus, I'll eat it every day. Okay, so maybe the desire to have a bowl of ice cream every day is the main reason I don't usually keep ice cream in the freezer. Plus, homemade right out of the ice cream maker is pretty rockin' so use store bought or homemade whatever strikes your fancy. I won't judge. For homemade, use your favorite vanilla ice cream recipe but add the 2 tsp cinnamon into the mix before pouring into your ice cream maker. Make the ice cream according to the ice cream maker's instructions. Butter a baking dish that is large enough to hold all the apples in a single layer. Combine brown sugar, apple cider, salt, nutmeg, and ground cloves in a small saucepan. Bring to a boil over high heat, constantly stirring until the sugar has dissolved. Reduce heat to medium and cook for 5 minutes. Remove from heat. Peel, if you want to, and core apples. Peeling the apples, I feel is an optional step. In the future I will keep the skin on the apples since I had to cut up the apples for my kids anyways. I had to use a small paring knife because I had nothing better to get the job done. I lost a little more apple that way but it worked so use what you have on hand. Place apples in baking dish, adding a few pieces of butter to each apple cavity. Pour cider syrup over the apples. Bake at 350, uncovered, for 45 to 50 minutes, basting often. Apples should be tender but still able to hold their shape. You can also make the apples in a crock pot. Cook the apples in the crock pot over high heat for about 2 1/2 hours. I enjoy the nutty taste of quinoa and forever ago when I made that Triple Coconut Cake for my hubby's birthday I had lots of leftover toasted coconut and a little bit of leftover coconut buttercream. So one morning I got a hankering for some coconuts and berries. 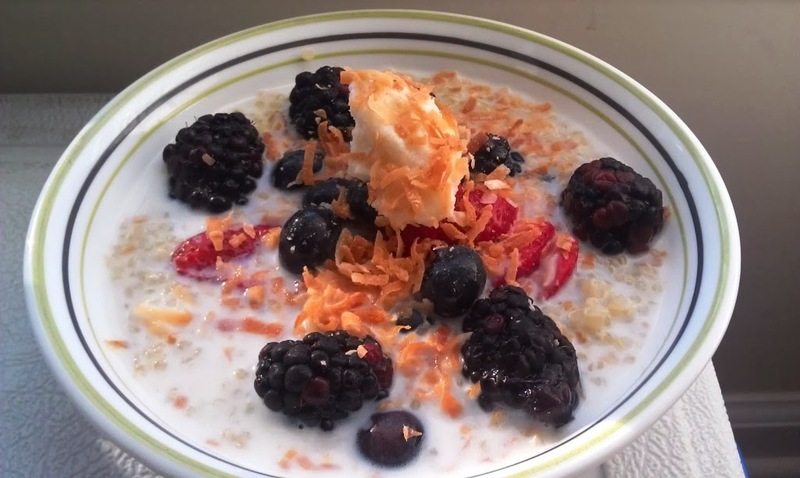 So I threw together some cooked quinoa, added some berries and coconut milk, and topped with coconut buttercream and toasted coconut. It was amazing and tasted like I was having dessert for breakfast which is a big thumbs up in my book. I made these cookies yesterday for our Preschool Valentine's Day party. They were a super big hit with all the moms who were there. I couldn't find any strawberry cake mix at the grocery store. So I kind of made my own with yellow cake mix and some Strawberry Nesquik. They turned out really well and my hubby might have had 4 when he got home from work. 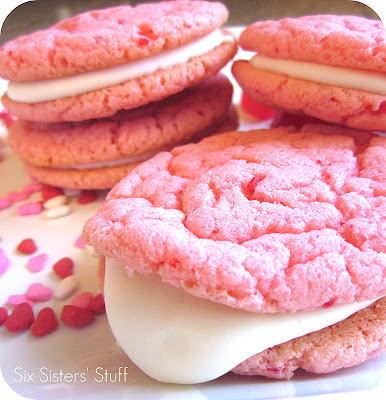 They come together really fast so it's not too late to make them for someone special today. 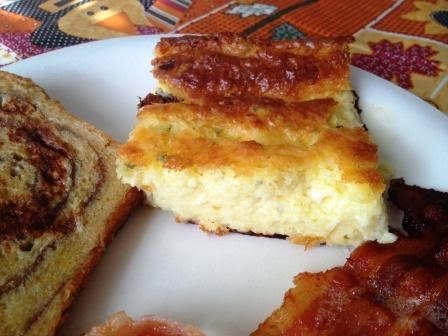 Does your family have a special holiday breakfast dish? My family's tradition is sorbian eggs. They are amazing and a great mix and dump kind of recipe. I love mine topped with salsa while my mom loves hers topped with avocado. We served ours up this year with cinnamon bread french toast, bacon, and some good old orange juice. Mix all ingredients together in large mixing bowl. Butter or grease a 9 x 13 baking dish and pour in the mixture. Spread out evenly in pan and bake at 350 degrees for 40 minutes or until mixture feels firm to the touch. It's raining here in my neck of the woods and I'm ready to sit by the fire with a cup of hot chocolate and just veg. This soup is a lightened up version of a staple in our house. This is one of my go-to recipes when I'm not sure what I want to make. I usually make up a double batch because we like it so much. 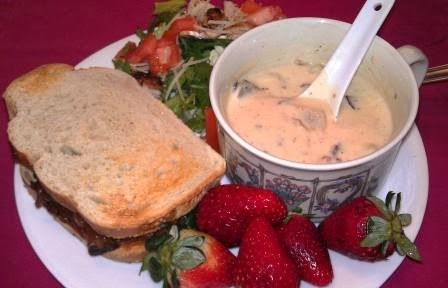 Serve it up with some salad and a sandwich and you have a super filling meal. And if you think by that picture that is my plate, don't worry that is a small serving for my super human hubby. He works hard and needs the fuel. Cook bacon until crisp. Add onion. Sauté 3 minutes. Pour off drippings. Add potatoes, water, salt and pepper. Bring to a boil. Cover and simmer 10-15 minutes. Gradually stir in soup, Greek yogurt, cauliflower puree, milk and parsley. Bring to serving temperature over low heat, stirring occasionally. DO NOT BOIL!